In all seriousness, a number of right-of-center / "neocon" bloggers are eating some crow right now, myself among them. I truly believed that Osama was dead, based largely on the slim-to-nil chance that he'd have kept silent since Tora Bora (when he was last heard from). As Froggy explained in detail, any number of major events -- by Osama's reckoning -- have happened since then. Osama was never a warrior, never any sort of military leader; he was a financier and a cheerleader, always seeking the spotlight so as to rally his "troops". For him to have kept silent for so long was unbelievable. There's been a lot of speculation about the authenticity of the tape. Personally, I don't think it matters much. Unless the tape is an obvious forgery, people will react to it as if it were of Osama himself. This applies to Americans, Iraqis, terrorists here and there, and so on. So we might as well assume that it's real. Having stipulated that, what can we expect next? And what can we learn from the tape? The American answer to Osama's proposal will be given on Election Day. UPDATE: Here's a more complete (and more authoritative) transcript of the videotape, at least those parts al-Jazeera was willing to show. You might want to check this out as well. Al Qaeda is down. It's time to kick, kick hard, and keep on kicking until there is nothing left to kick. Roger Simon agrees; he also isn't concerned with the authenticity of the tape, although for different reasons. Despite my fervent hopes, it seems that UBL is alive and kicking and probably registered to vote in Ohio as a Democrat. After 9/11 there was not much else to do. > After 9/11 there was not much else to do. Sam, I guess this comes down to a philosophical difference. Was 9/11 a one-time event, to be dealt with as a law-enforcement matter (as Kerry advocates), or was it part of a long-term war, to be fought as a war (as Bush advocates)? Personally, I'll go with the second choice (which won't surprise you much). 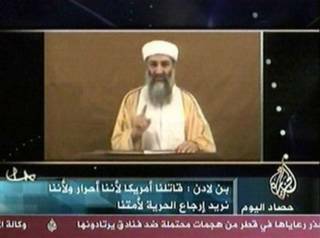 As such, I don't believe that capturing Osama bin Laden was Bush's primary task. His primary task was to neutralize terrorists and terrorist organizations that posed a threat to the United States, and to do what was necessary to get us there. Nor do I believe that after 9/11 "there was not much else to do". Here, too, is a difference of philosophy. If a schoolyard bully hits you hard, do you tell him to stop and hope he listens? Do you tell a teacher you've been hit, and hope they'll keep an eye on the bully for you? Or do you decide that this is an ongoing problem, to be dealt with as such, and do you then take steps to make sure he doesn't hit you again? My view is that terrorism has long been a problem, affecting Americans and others alike; but it took 9/11 to wake us up to what the terrorists would do to us if they could only figure out how. If we leave the door open for another major attack, we'll get one... and it will likely make 9/11 seem tame and mild by comparison. Getting Osama will not make us safe; rooting out the terrorists will. Of course, that's my philosophy; yours may differ.